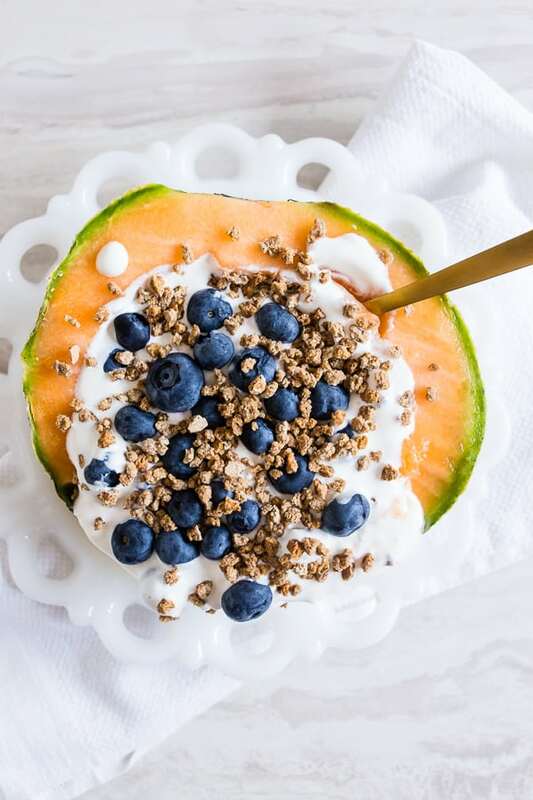 This crunchy yogurt cantaloupe breakfast bowl is the perfect no-cook breakfast that is full of flavor, fresh summer fruit and protein all topped with crunchy Grape Nuts cereal. You’re going to love this quick and easy summertime breakfast bowl. Growing up we always grew cantaloupe in our garden. It was great until all if it became ripe at the same time and we were drowning in melon. So. Much. Melon. If you have never grown cantaloupe it’s the zucchini of the fruit world. People will soon stop coming around for fear you’ll try to load them down with melons. Of course, now that I’m all grown up without a garden I wish I had one! One of my favorite ways to use up cantaloupe was to fill it with yogurt or cottage cheese and DEVOUR! 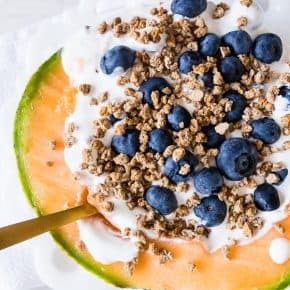 For these crunchy yogurt cantaloupe breakfast bowls, I decided to take it a step further by throwing on some fresh blueberries and Grape Nuts. I know, Grape Nuts. When was the last time you heard anyone talk about those? I seriously am a Golden Girl because at the current moment I’m writing about how much I love Grape Nuts while wearing a housecoat. I’m totally living my best life. Of course, if you’re not a fan of Grape Nuts granola could easily be used in place. I just can’t be trusted with granola in the house because I eat it like candy. Side note: if you want the best granola every you gotta make my banana bread granola because it’s LEGIT! Oh, totally random but what do you call cantaloupe? Growing up we always called it muskmelon and then when I moved to New York people looked at me like I was CRAZY for calling it that. Is this a Midwest thing? Maybe just an Ohio thing? Maybe just a weird Brandy family thing? I don’t know. Weight in. I gotta know. 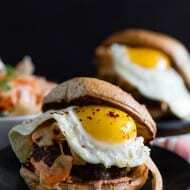 Looking for ways to switch this recipe up? 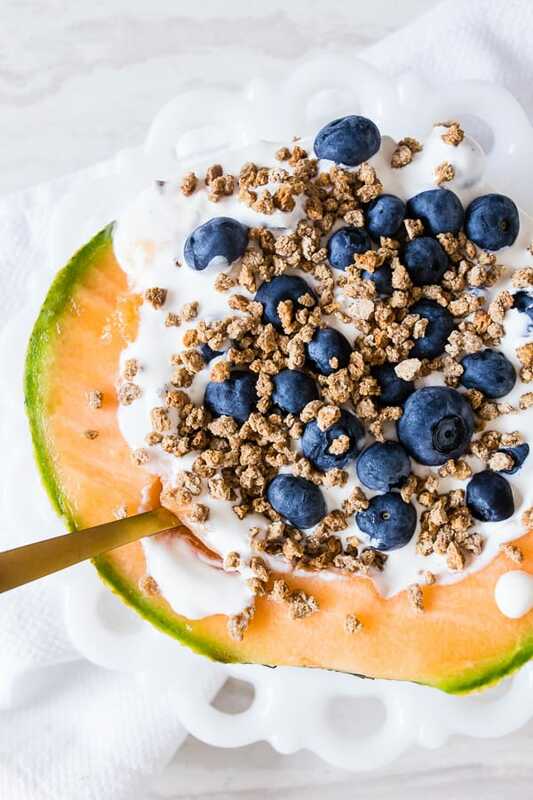 This crunchy yogurt cantaloupe breakfast bowl is the perfect no-cook breakfast that is full of flavor, fresh summer fruit and protein all topped with crunchy Grape Nuts cereal. You're going to love this quick and easy summertime breakfast bowl. Add 1/2 cantaloupe to 2 plates. 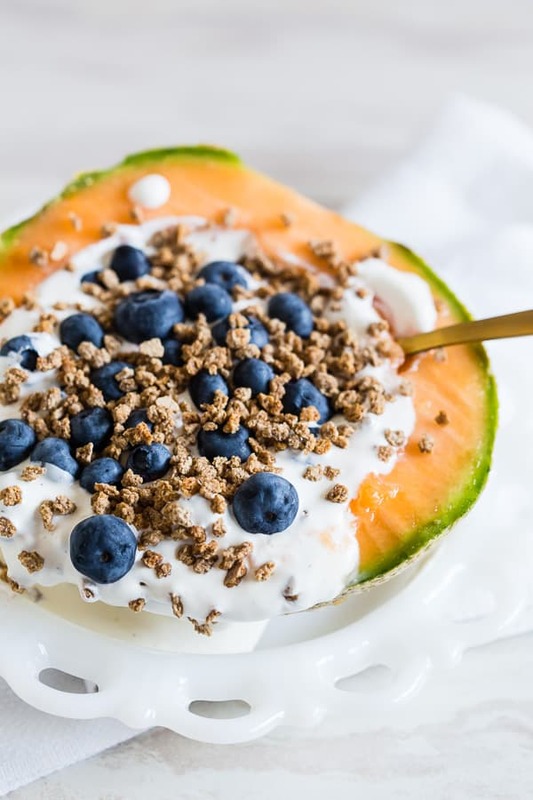 Add 1 cup vanilla Greek yogurt, 1/4 cup blueberries and 1/4 cup Grapenuts cereal to hollowed out center of each cantaloupe. I see this breakfast in my near future! Looks amazing! Perfect breakfast bowl. GAH this is a fantastic bowl of freshness! I love all the textures! 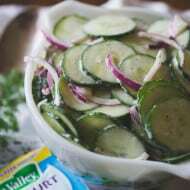 What a delicious and easy way to start the day! Perfect summer breakfast that doesn’t heat up the kitchen! This is the perfect summer breakfast! 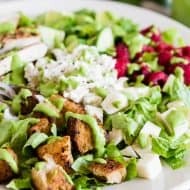 I love this idea – it looks so yummy and fresh! So funny about melons in the garden: I experienced that as a kid! Haha! What a super idea, love it! I love the use of a cantaloupe! I love what you have in it for breakfast!